Funding information is recorded in two fields in a PubMed record: Grant Number and Publication Type. Limiting a search to these fields can help you find articles that were supported by a specific grant, funder or type of funder (e.g. non-U.S. government). Grant Number: The Grant Number field records grant or contract numbers as published in the article, or derived from PubMed Central as a result of the NIH Public Access Policy. To find articles funded by a particular organization, search the Grant Number field for the organization’s name, acronym or 2-letter code (click on link above for complete list funding agency names, acronyms and codes). For example, to find studies supported by the National Institute on Aging, search PubMed for: AA[gr]. Publication Type: Medical Subject Headings (MeSH), the standardized terms used to describe articles for MEDLINE, include Publication Types to identify financial support when that support is mentioned in the article. A list of publication types, including those for Research Support, can be viewed from the link above. To filter a search by one of the funding Publication Types: in the left-hand column of a results page, click ‘Customize’ under Article types. Scroll down and check the box next to the types of Research Support you would like to view. Click ‘Show’. The types of research support that you selected should now be visible under Article types. Click the research support type to filter your results. Topic-specific queries in PubMed are carefully constructed search strategies that can either be applied to a set of results as a filter or added to a search using ‘AND’. Each of these searches has been created by an expert, tested to optimize sensitivity and specificity, and is periodically updated. To view a complete list of the available searches, click the ‘Topic-Specific Queries’ link under PubMed Tools on the PubMed homepage. This will bring you to the Directory of Topic-Specific PubMed Queries, where you can view the available subject searches, which include: AIDS, bioethics, cancer, health disparities, toxicology and veterinary medicine. Clicking the link for a subject either limits your PubMed search to that subject area (i.e. applies a filter) or brings you to a page with the search strategy and additional resources. 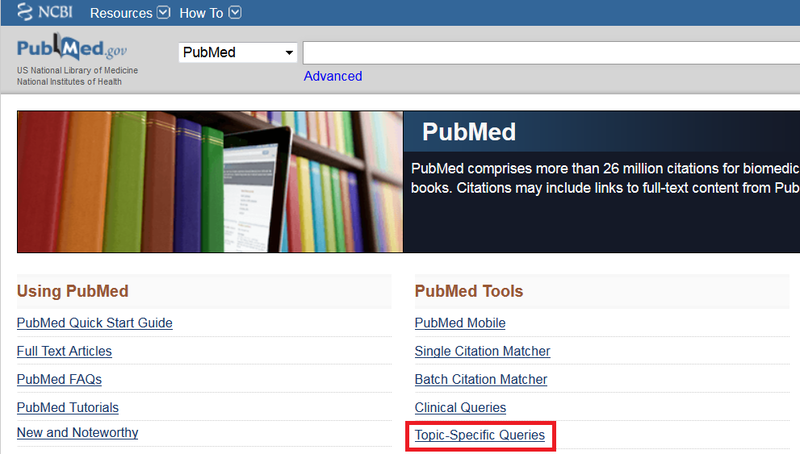 Topic-Specific Queries link on PubMed homepage. Some of the searches can also be applied as filters from a search results page. To do so, click the ‘Show additional filters’ link in the left-hand column of a PubMed search results page. Check the box next to Subjects and click the Show button. Select a link under Subjects to narrow your results. If you do not see a particular filter, then click the ‘Customize’ link under Subjects to choose additional filters. I don’t use topic-specific queries too often, but they can save you a lot of work if an appropriate search filter has been constructed for your topic. If you have limited information about a journal article (e.g. 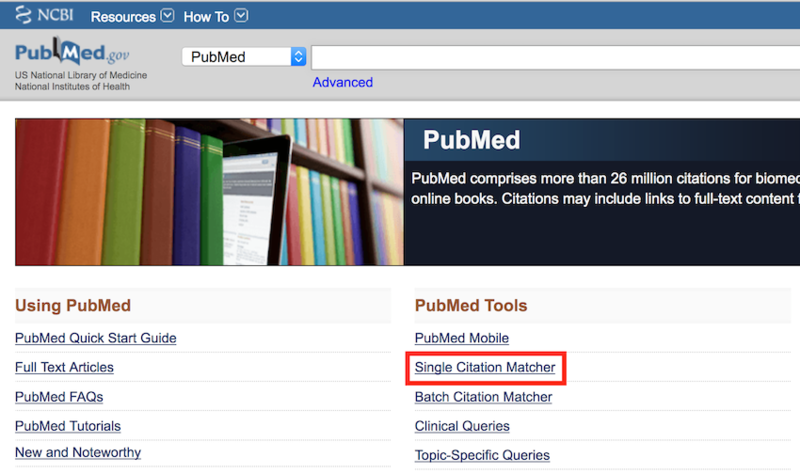 author name and year of publication), then PubMed’s Single Citation Matcher may help you locate the article. Accessible from the PubMed homepage, this tool does exactly what its name implies: it matches citation information to PubMed records. Single Citation Matcher can quickly narrow your search to records that match the information you have. 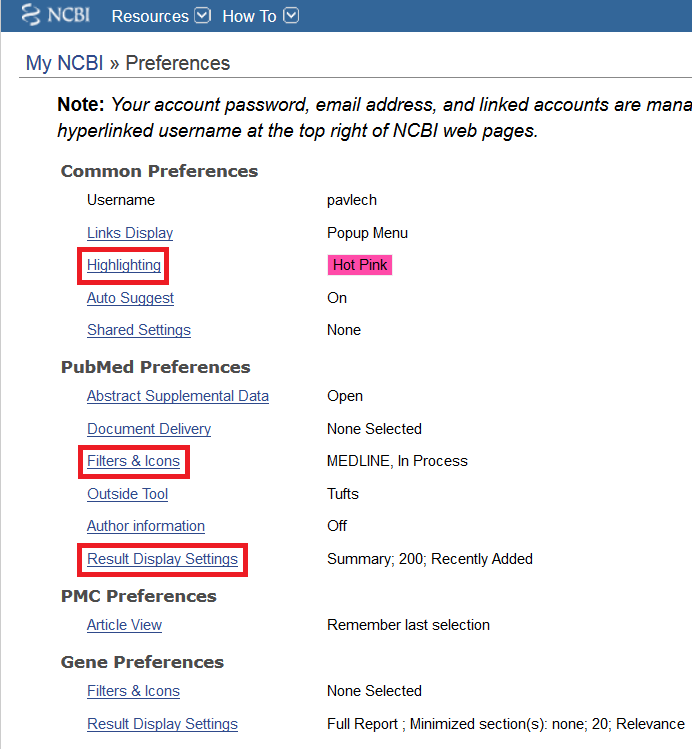 You can customize your preferences to make searching PubMed and other NCBI databases easier. Log in to your My NCBI account (see Insight March 2016 for details on creating a My NCBI account) and click the ‘NCBI Site Preferences’ link in the top right corner of the homepage. Highlighting: Highlights your search terms in a set of results, making scanning for relevant articles more efficient. Filters & Icons: Personalized filters displayed in the right-hand column on results page. I recommend adding the MEDLINE filter, which limits results to articles that have had MeSH terms applied to them. To do so, click on the ‘Filters & Icons’ link on the Preferences page, and on the page that opens, select the ‘Properties’ radio button. Enter ‘MEDLINE’ in the search with terms box, then check the box next to MEDLINE. You can also add the ‘Find it @Tufts’ button, which enables you to access the full text of an article through Tufts Libraries. Adding this button to your NCBI account would obviate the need to access PubMed through the Hirsh Health Sciences Library website. To add the ‘Find it @Tufts’ button, select the ‘LinkOut’ radio button on the Filters & Icons page. Then, enter ‘Tufts University’ in the search box and check the link icon box next to Tufts University Hirsh Health Sciences and Veterinary Libraries. Outside Tool: A simpler method of adding the ‘Find it @Tufts’ button to your account preferences. Click the ‘Outside Tool’ link on the Preferences page. On the page that opens, select the radio button next to ‘Tufts’. Result Display Settings: You can choose the format (summary or abstract) in which results are displayed, how results are sorted (I do not recommend changing this from the default, recently added), and the number of items per page (I prefer 200, so I don’t have to click through multiple pages). These are just a few of the preferences that you can adjust in your My NCBI account. You can also explore customized settings for other NCBI databases, such as Gene. 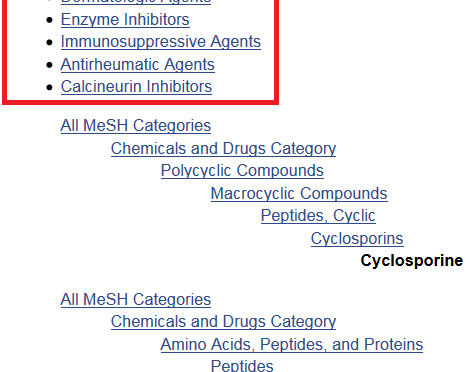 The Medical Subject Heading (MeSH) vocabulary includes headings for the pharmacologic actions of drugs. Each drug and chemical in the MeSH vocabulary is assigned one or more of these headings. The pharmacologic action headings can be used to find information on the action of a drug or class of drugs. Find articles in which a specific action of a drug is discussed: Combine the MeSH heading for the drug or chemical with the MeSH heading for the pharmacologic action of interest. In order to use this method, you need to know which pharmacologic action headings have been assigned to the drug or chemical. This information can be found in the MeSH record for the drug. 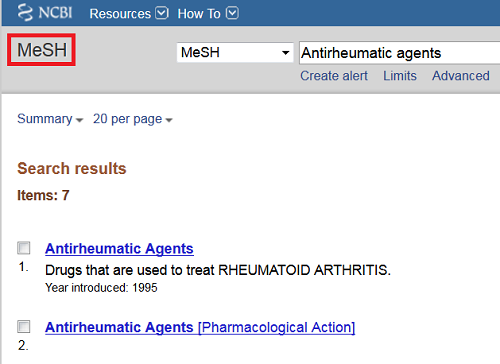 To search the MeSH database, choose ‘MeSH’ from the dropdown menu to the left of the PubMed search box. Find articles in which any drug or chemical exhibiting a certain action is discussed: Use the pharmacologic action field tag, [Pharmacologic Action] or [pa]. This search would likely be added to another, using ‘AND’. 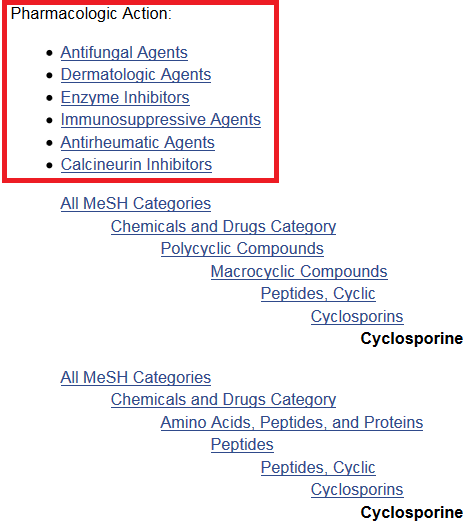 View a list of drugs and chemicals identified as having a certain pharmacologic action: Find the record for the term, labeled [Pharmacologic Action], in the MeSH database. Use the common name: PubMed is not primarily a resource for chemical information, so forget what I said in my column about not searching by name. Enter the common name for a chemical, drug or other substance in the main search box. Scroll down the results page to the ‘Search Details’ box in the right-hand column to check to see if the name you entered matched a MeSH term. Use the standardized name: To search by standardized name in PubMed, replace any brackets or parentheses with a hyphen (if not already present). You can either spell out or enter the symbol for Greek characters such as β. Search the MeSH database: Didn’t find what you were looking for when you searched by name? Try searching the MeSH database. Select ‘MeSH’ from the dropdown menu to the left of the main search box. Enter a component of the name. Try a unique identifier: In either PubMed or the MeSH database, enter the CAS RN or FDA Unique Ingredient Identifier (UNII, identifier assigned by the FDA Substance Registration System to substances in drugs, biologics, foods and devices) for a substance. If searching PubMed, then enter the identification number, followed by the field tag ‘[RN]’. For example: 69-93-2[RN]. I find this method of limited utility, partly because CAS RNs have not been added to MeSH since 1998. You can save searches to your My NCBI account (see PubMed Tip of the Month for March 2016), and choose to receive daily, weekly or monthly emails when new articles meeting your search criteria become available. To save a search, simply click the ‘Create alert’ link under the PubMed search box on any results page. If you are not already signed in to your My NCBI account, then you will be prompted to do so. Name your search and select whether or not you wish to receive email alerts. Once you have saved a search, it will appear in the Saved Searches box in My NCBI, where you can see a list of your searches, the last time you ran a search and any new articles that have been added to PubMed since you last ran the search. Saving searches saves time and frustration, and allows you to remain current on articles in your area of research. As I mentioned in my March post, the My Bibliography section of My NCBI allows you to save citations to your journal articles, book chapters, presentations, meeting abstracts, etc. This list of citations can be shared via a stable URL, exported to a text file, or saved as a PDF. NIH recommends using My Bibliography if you wish to include a link to a complete list of published works in your biosketch. My Bibliography is also used to demonstrate compliance with the NIH Public Access Policy on progress reports. Log in to your My NCBI account, find the My Bibliography box (note: you can drag and drop the boxes in My NCBI to change the order in which they appear) and click the ‘Manage My Bibliography’ link. Once you are in My Bibliography, use the buttons in the right-hand column to add a citation from PubMed (preferred method), manually (use for articles not in PubMed, or other products, such as meeting abstracts, presentations or data sets), or from a file (must be in either MEDLINE or RIS format). Citations can also be added to My Bibliography from any PubMed results page. Click the boxes next to the citations you wish to add, then choose My Bibliography from the Send to dropdown menu at the top of page. Click the ‘Edit settings’ link at the top of the My Bibliography homepage. This will bring you to a page where you can change your sharing settings from private to public. Once you do so, the URL will appear at the top of your My Bibliography homepage. Note: do not copy and paste the URL that appears in your browser when you are in My Bibliography because this is different than the unique URL generated for your collection.